So I called a bunch of local dealers to get on list to build and order an RS... doesn't look too good fellas...A.) cars are at least 12 months away and B.) the dealers are doing 1 of 2 things.. 1.) compiling a list and offering those on the list to pay at least $30k or more above MSRP or 2.) not making a list, spec'ing the cars themselves and will sell above MSRP off the showroom floor. If anyone knows of a dealership willing to sell TWO RS' (1 for me and another for my brother-in-law) and allow build to order at MSRP, please let me know. I want a no-option car for track. Thank you! I would extend the net far and wide, especially since you're situated in a seller's market in Southern California (even despite the numerous dealerships in California). Have you tried Brumos? Porsche Exchange in Chicago? I would extend the net far and wide, especially since you're situated in a seller's market in Southern California (even despite the numerous dealerships in California). Have you tried Brumos? Porsche Exchange in Chicago? Finding the same thing in the Midwest. I fear that if one has not already secured a place on a dealers allocation waitlist for an RS, with some written commitment to purchase at MSRP its going to be tough to obtain one of these 'golden geese' at this point without paying the piper for the privilege! The hope is always that there will be honest dealers who care more about established/establishing lasting relationships for continued/future ownership vice playing the greedy hand. Certainly the pros and cons to economics whereas the side of the fence you stand on (consumer vs dealer) will define them. Not sure if anyone has seen looks a little different. front splitter is about 1/2" deeper than standard GT3. what we've been seeing for some time. dive planes same as recent photos as well. looks good. time to stop with the drip, drip, drip, and get it out there. ...time to stop with the drip, drip, drip, and get it out there. 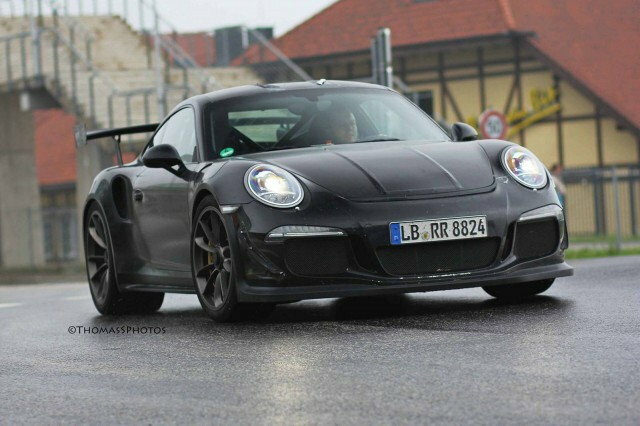 I agree as this is driving me nuts I've hedged my bets and have a GT3 coming but am on the list for the RS. Just waiting on final specs and pricing to see if I will follow through with the RS. It needs to be something special for me to upgrade. IF the Paris Auto Show is the grand unveiling (~6 weeks away), at what stage does Porsche begin to do real-world testing of the "leaked" ventilation above the front wheel arches? I know this design has already had extensive real-world testing with the 458, probably the C7 Z06, etc., but when does a manufacturer conduct its testing in the elements while using appropriate testing instruments? I'm always curious as to when the design cut line is officially crossed without non-wind tunnel and CAD testing being factored in. I would believe they have already done extensive testing at their secretive test track, no? Then for some reason they decide to leak the car with a few parts camouflaged. Good point, Sam. I didn't even think about private facilities under the guise of secrecy given the world of persistent photogs. The usage of front ventilation is nothing new, but I'm always intrigued with placement (above vs behind the wheel well) and their effectiveness hence my curiosity on real-world testing scenarios. Hopefully, it does better against the $75k Z/28. I don't think it has a chance against the Z06, but it should be able to embarrass a Camaro. Something the GT3 couldn't do.